It’s State of the Art. Carlson has decades of experience developing anodizing processes that are unmatched in the industry. Unlike most anodizing operations, Carlson operates two anodizing tanks on both the Type II and Type III lines. Tanks accommodate large parts up to 5’ wide x 10’ long and allow processing of load sizes larger than 600 square feet. 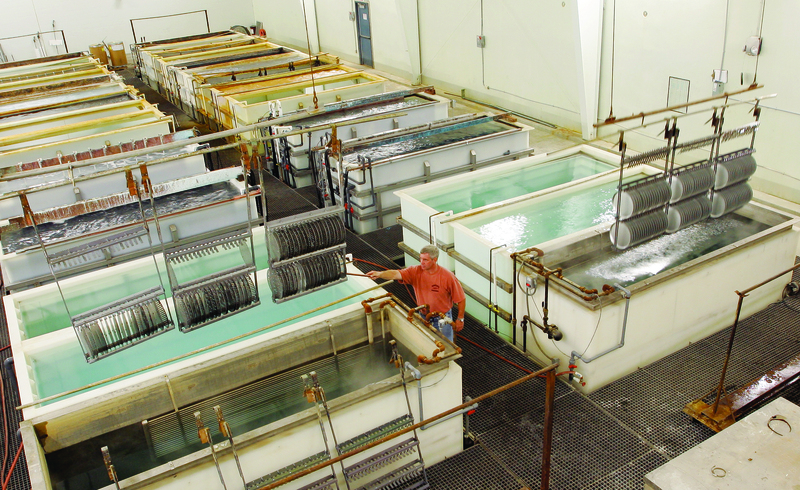 The anodizing facility processes one piece to as many as 30,000 pieces per day. Lead times are typically shorter than other anodizing facilities and we can often turn parts around in as little as one day upon request. The goal is to run orders within one week. Expediting is common, as required by the customer. Type II Clear Coat and Type III Hard Coat anodizing provide desirable qualities that provide a superior finished product. For large orders with thousands of units required to launch new products, Carlson’s anodizing capacity and capability is a big part of the company’s historic on-time performance. Process control on the anodizing line starts with metal quality inspection,continues with innovative racking, and ends with un-racking, final inspection and packaging. Quality control procedures at Carlson include documented inspection of parts both before and after the anodizing process to ensure customer compliance.